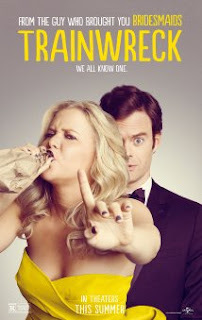 Movie Review: “Trainwreck”, starring and written by Amy Schumer, is the best comedy directed by Judd Apatow, who never convinced me before with movies like “Knocked Up” or “This is 40”. This film succeeds on many fronts, and I left the theater with a big smile on my face, even disliking its totally staged ending, fancied at the New York Knicks’ Madison Square Garden, which if more extended could really have wrecked what had been done till there. Regardless the final slip-up, the merits go totally to Ms. Schumer, a stand-up comedian who shines with her engaging semi-autobiographical work. Here, Amy plays Amy, a writer who works for S’nuff, a men’s magazine whose unkind director, Dianna (Tilda Swinton), gives her the worst assignment ever: to write an article about the reputable sports doctor, Aaron Conners (Bill Hader). Obviously, sports are not part of Amy’s life. Instead, she prefers getting drunk, smoking pot, and sleeping with boring guys she picks on her nights out. The only one who’s recurrent is Steven (John Cena), a well-intentioned bodybuilder who gets devastated when he finds that she sleeps with many other men. At this point, we recall the first scenes of the film where, in her childhood, Amy and her sister were told by their father that ‘monogamy isn’t realistic’. If Amy opted for following the advice of her father, her sister Kim (Brie Larson), by contrast, did the opposite, living happily in the suburbs with her husband and stepson - a life that Amy simply doesn’t understand and constantly mocks. Everything changes abruptly when the generous Aaron and the disoriented Amy fall in love, in spite of her difficulty in accepting his true love and control her addictions. “Trainwreck” worked great as a romantic comedy, and the jocular tones are as pleasing as the dramatic side, where we can find a sort of bittersweet honesty. The presence of NBA stars, LeBron James and Amare Stoudemire, conveys a bit more of reality while also provides funny moments.